Mix everything but the wrappers together in a large bowl- making sure that all of the spices are well blended into the meat. Set yourself up at a table with a baking sheet, a small bowl of water, your wrappers, and meat mixture. One at a time, place a small scoop of filling into the center of a wrapper, dip your finger in water and moisten 2 edges of the wrapper and fold over to create a triangle. Pinch the edges closed (the water helps them seal) and then pull together the two long points, moisten in the center and pinch together. You can just leave them as triangles but that last step takes no time at all and the end up looked better, not to mention that I think they hold together better when cooking. 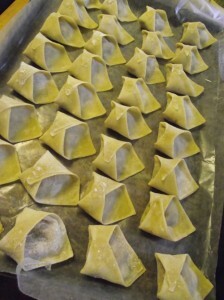 As you make each wonton, line them up in rows on your baking sheet and once it’s full, pop it in the freezer for about 20-30 minutes while you start the next batch. You want them to be semi frozen before you package them into bags of 10 or 20 or whatever you want- it keeps them from losing shape and clumping together. Keep going until you run out of filling and presto! 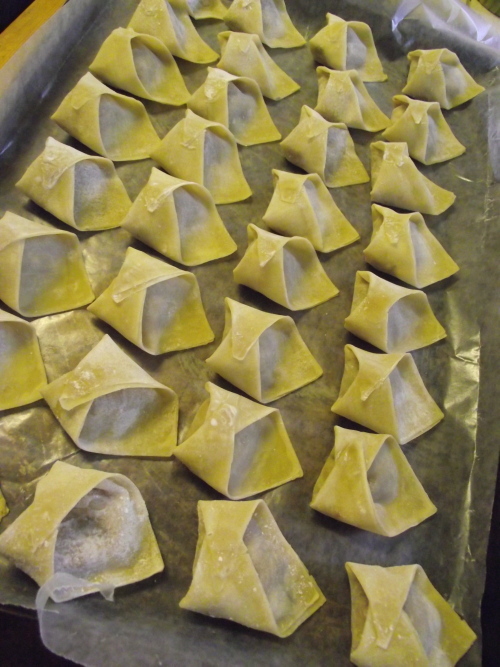 You have a freezer full of wontons ready when you need them.